Fiorentina striker Valeri Bojinov has completed his move to Manchester City for an undisclosed fee. Bojinov, who has signed subject to being granted a work permit, is the latest foreign import to new boss Sven-Goran Eriksson's squad. 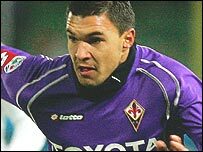 The Bulgaria international, 21, made his Serie A debut at the age of 15 for Lecce before making a £9m move to Fiorentina in 2005. Bojinov, who spent last season at Juventus, has agreed a four-year deal. City chief excutive Alistair Mackintosh said: "Our signing of Valeri is another sign of the impact made by Dr Thaksin Shiniwatra and Sven-Goran Eriksson. Valeri is an exciting young player and a great addition to the squad." And European football reporter Dave Farrar forecast that Bojinov would "light up the Premier League." Farrar told BBC Five Live that the capture from Fiorentina can emulate a previous Maine Road cult hero. He said: "Bojinov's got all the talent in the world, and I can see him being a Georgi Kinkladze-style fans favourite. "He's one of those players around whom there is always something happening. He's a fun signing." The 21-year-old is Eriksson's fourth signing in two days after deals for Javier Garrido, Vedran Corluka and Elano were completed on Thursday. He is Eriksson's eighth signing since being appointed City manager last month.